During March 2017, parliament in Canberra became flooded with scientists of all kinds of flavours for two days as Science met Parliament in this annual event. This event aims at increasing the dialogue between politicians and scientists to increase the awareness and understanding of how STEM can drive Australia’s economic, social, environmental, and cultural future. I was lucky to be picked as one of two early/mid-career plant scientists representing the Australian Society of Plant Scientists. The two days were filled with quite unique experiences, including a full day of career development and preparation for meeting the parliamentarians, and then, of course, one big day in Parliament. Australia’s Chief Scientist Dr. Alan Finkel opened the first day setting the scene for what to expect. This was followed by sessions on how science is turned into news and used to shape policy. The focus of the day, however, was on how to make the most of the little time we had for our meeting with the parliamentarians. How much science background could we expect? How detailed should we present our work during our meeting with the parliamentarians? In preparation, we paired up in small groups to practice our ‘elevator pitch’, where we were challenged to explain the nuances of our work in a minute or two, to people outside our fields of expertise. My major lesson from this exercise was discovering the fast pace at which politicians move from one topic to the next. This also turned out to be a great networking opportunity, allowing me to meet scientists from diverse fields of research across all of Australia. The highlight of the day, however, was a gala dinner at Parliament House, where we heard from the newly minted Minister for Industry, Innovation and Science, The Hon Arthur Sinodinos, and the Leader of the Opposition, The Hon Bill Shorten, as how they might envision science in future politics. On the second day, we were inspired by Australian of the Year, Prof. Alan Mackay-Sim, and had the chance to meet the Shadow Minister, The Hon Kim Carr. Lunch was broadcast live on TV at the National Press Club, where the Minister for Industry, Innovation and Science was grilled with questions from the press. The definite highlight of the day was meeting our parliamentarians. 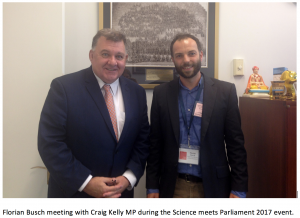 I was paired up with two other scientists to meet with MP Craig Kelly. This is when practicing our ‘elevator pitch’ the day before paid off; I only had a few minutes to discuss the role of photosynthesis research in securing food production before MP Craig Kelly ran off to his next meeting. He left us with a deep impression of how parliament works and, hopefully, we left him with some insights into how science works and can shape the economy. Contact: Florian Busch (florian.busch@anu.edu.au) for further enquires.